Do you have a diamond or colored stone that you love, but aren't enjoying because it's set in an outdated, worn or damaged mounting? 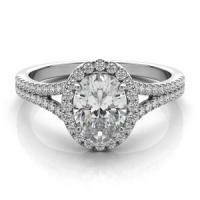 Consider remounting the stone into a brand new ring or pendant! We have a large selection of fascinating remount styles. In reality, our entire inventory is a remount possibility - we can order any mounting without the center stone, and set yours instead. Purchasing a larger diamond from us, but don't want to give up your original diamond? Turn your old diamonds and colored stones into brand new jewelry!